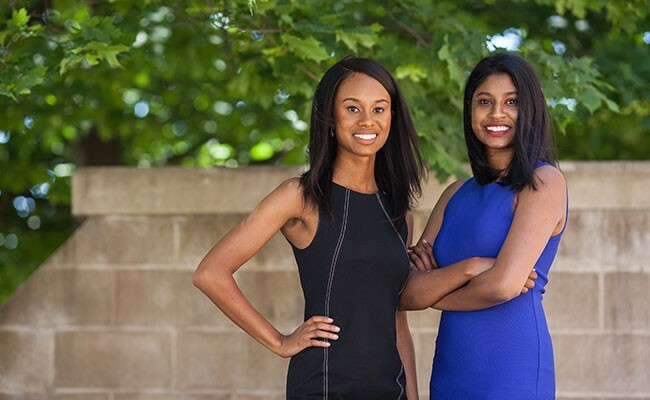 Ariel Gough and Edwina Govindsamy are aiming to innovate with Bailly Perfume Oils, a vegan, cruelty-free line of coconut oil-based signature scents. When Ariel Gough and Edwina Govindsamy first met—on a friend date set up by Gough’s mom—there was good energy right away. “I think the first time that we met for coffee at Starbucks, we just clicked and knew that we wanted to start something together. It took us awhile to figure out what that was,” Gough says. Govindsamy agrees. As they settled seamlessly into a close friendship, the duo began daydreaming of what their side-hustle could be in this #girlboss age. “I remember we wanted to do headphones. It was very random, but I remember us thinking ‘Oh, wouldn’t it be great to go into a coffee shop or Starbucks and just grab headphones?’ But then we realized it wasn’t very innovative,” Gough recalls. “The other one was wireless charging, but we realized we’d be going up against tech giants like Apple. We also thought about coffee mugs and then Korean beauty products,” Govindsamy adds. When the pals realized that perfume was a vital part of both of their beauty routines, an idea took root: A line of high-end, roll-on, coconut-oil based fragrances that were easy, feminine and wearable—titled Bailly Perfume Oils. “Right now, in Sephora, there are no perfume oils on the shelf—maybe one by Elizabeth and James,” Govindsamy adds. Their debut scent, called Brilliance, fills a void with an offering of black currant, patchouli, vanilla and pear notes, delivered in a coconut oil base that’s vegan, cruelty-free and paraben-free. “We basically went to Sephora and Shoppers and smelled everything that they had and made a list of the types of scents we liked—we like sweet and gourmand scents and something a little fruity—and we’d go to the perfumer and tell them what we liked and they’d then do the mixtures and send back samples,” Govindsamy says. The scent will be available for purchase later this month, you can check their website, bailly.co, for launch details (and to shop online). "If people feel uncomfortable I don’t mind that."